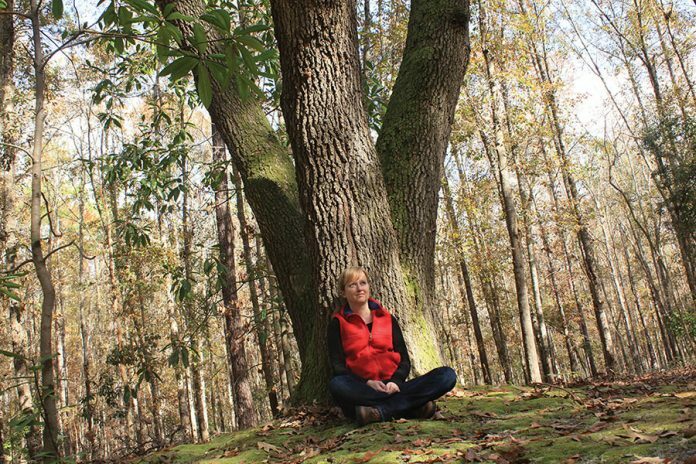 You don’t have to disappear into the woods to reconnect with Mother Earth. With a little creativity, you can create an eco-retreat in even the smoggiest city. One of the exercises at Springbank is an Earth Walk. Find a greenspace and follow these simple instructions: Walk around outside quietly and let nature call to you. When you find yourself attracted to something—be it a plant, pebble, or flower—ask permission to visit it. If you feel you have permission, pick it up or sit next to it. Concentrate on this ‘being’ as a living spirit. Consciously send your love to it, honoring it as an expression of the Creator. When it’s time to leave, express gratitude to your ‘gift’ and leave it in its natural area. Most urbanites suffer from what author Richard Louv calls nature-deficit disorder. Carve out your own special spot outdoors. It can be your backyard, a nearby park or even your back porch. Spend time there each day to quietly connect with the natural world. Surround yourself with houseplants, collect rocks from walks in the woods, or pluck shells from the beach. Try a desktop water feature, or play the sounds of nature on your smartphone. Weather permitting, open a window. Working in a backyard garden has restorative powers, but even a container garden on your back deck or windowsill will do. When you nurture an edible landscape, it nourishes you right back.